Experience and Know-How - 30 years of accumulated experience and know-how in orthopaedic devices and shoes. Common stiff walkers are mostly used as a cast replacement due to their rigid, stiff construction to immobilize the ankle joint. But do they immobilize in the ankle joint as required? And if so, in how far can a modular walker, combining an Orthosis/Splint and post-OP off-loading shoe, be similar or equal effective? Immediately after complex surgical intervention a half cast, splint, or similar stabilization is given to prevent movements in the operated area. This splint will be worn only during bedrest. Once the patient can be mobilized, the splint will be replaced by a cast or a common, rigid walker. Even after "Lapidus" procedures a walker might be indicated. Although such a walker construction seems to be stiff and rigid, ankle movements can still me measured(3). Due to a lack of anatomical fit in the ankle area. Therefore post-op treatments which require a full immobilization of the ankle will still require a full contact cast. As the Relief Insert® Walker shows equal stability and equal joint movement as a rigid walker, it is definitely an alternative with the advantage to use the splint immediately post-op in the OR, to build a fully functional walker for walking, removing the shoe at night time and still be secured with a splint. In addition to all this, the combination of the components also allows a "downgrading" from a walker to an offloading post-op shoe once convalescence allows a support with a post-op shoe only. (1) Dietrich, Th. (2015) "Biomechchanical Analysis of Pressure Redistribution"
(2) Peikenkamp, K. et al (2015) "Biomechanische Vergleichsstudie zum Relief Dual® Fußteilentlastungsschuh"
A pediatric flatfoot can be caused by a variety of reasons and surgical therapy may be indicated. The catch is to correct the hindfoot without impacting the structures and alignment of the forefoot. The majority of the young patients already benefit from an Achilles tendon and/or gastrocnemius muscle lengthening to increase ankle joint range of motion. A subtalar implant is indicated in the event of a hyper-pronated foot and where stabilization of the subtalar joint is required. It blocks forward, downward and the medial displacement of the talus, thus allowing normal subtalar joint motion. Excessive pronation and the resulting sequela will be blocked with this minimally invasive technique. One of the most commonly used lateral column procedures in both the pediatric and the adult population is the Evans Osteotomy. According to Dr. Baravarian, this is the single strongest hindfoot alignment procedure. Postoperatively and in most cases, a cast might be required. This is especially true for younger patients (kids). Recovery time can be anything between six to eight weeks. An adequate cast shoe or post-op shoe with a rocker sole will help to mimic the normal gait during the healing process. Physicians seek to achieve the best results based upon indications and within the confines of available resources. Therefore, a natural or synthetic cast may be the best solution at hand. Orthopaedic casts were first developed in the 1850s and their aesthet ics haven't changed much over the past 160 years. A cast can be used to brace, immobilize, protect as well as off-load at and around the foot and ankle, hence providing effective treatment for many indications. Fiberglass replaced plaster in the 1970s and waterproofing arrived in the '90s. Walking on a cast without protection can lead to cast damage and other complications. Foreign bodies can find their way through the sole of the cast (pic 1 & 2), and the toes are exposed and unprotected. In the 1950s, rubber heels were invented and are still often used today (pic 3). The rubber walking heel prevents direct contact of the cast with the ground and is designed to make the gait more comfortable. But the height difference can lead to biomechanical stress and may interfere with a normal gait cycle. This can be avoided with a height compensation shoe (pic 4). The abnormal walking pattern often leads to lateral rotation affecting the ankle joint. This is especially true after several days as the cast loosens around the calf due to muscle atrophy. Self-Repair strategies are often seen, including "shoe-like" improvements (pic 5 & 6). 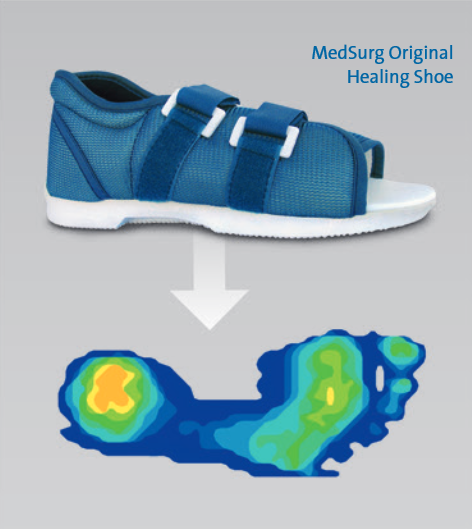 These improvements can easily be achieved with an off-the-shelf cast shoe, which not only provides protection, but can also allow the patient to experience a normal gait cycle as much as possible while wearing a cast. As long as the upper and lower ankle joints are properly aligned, the cause of plantar ulcers at the heel/calcaneus are often forced by foreign bodies (i.e. little stones in the shoe) and by shear forces, especially in Hawaiian style sandals. In addition, intrinsic deformities, as with bone spurs might create high peak pressure points resulting in plantar ulcerations. Usually in human gait, after the swing phase, the first ground contact is made with the heel. In the event of heel injuries, ulcers, pain, etc. this first heel strike needs to be avoided. An off-loading shoe can facilitate this, but the proper use of this effective shoe is critical for success and the over-all healing process. Patients require proper instruction and training on the correct gait method when wearing these medical devices. And they must understand how a correct gait pattern will reduce trauma to the heel. Ideally, a patient's initial contact should be with the forefoot, as seen with some running styles. This simple alteration in gait can shift additional load to the forefoot. In the event of existing injuries or ulcers on the forefoot, contraindicate the use of such a rear foot off-loader. Special attention is also necessary in the case of Achilles tendon injuries. A "forefoot-gait" coupled with a rear foot off-loader, may create additional tension in this area. Additional aids may also be required such as a height compensation shoe to be worn on the contralateral side or crutches may also be used. In conclusion, proper education and gait training must be regarded as an important aspect of the healing process. Currently there are several classification systems known to specify a Diabetic Foot Ulcer (DFU). Some of them are very complex, some of them are too superficial, and some of them are simply not efficient. Jeffcoate stated in 2003(5) that "...there is no widely accepted method for classification or even describing foot ulcers. Non-specialists commonly refer to all ulcers as diabetic foot. Two international working parties are trying to define a system of describing individual ulcers to improve communication and develop a classification for audit and research. Without classification, selection of comparable populations for urgently needed multicenter trials will be impossible ..."(5). Such comments like "not widely accepted" or "not commonly used" appear all the way through the literature, even in the latest cited reference of 2012(24). In 2006 the Editors comment in Podiatry Today, Vol. 19 Issue 6 May(6), asked "Can a Diabetic Foot Surgery Classification System Help Predict Complications?" Researchers concluded that a non-vascular surgical classification system - including variables such as neuropathy, open wound and acute infection - may help predict peri- and postoperative complications. "...Armstrong believes the non-vascular diabetic foot surgery classifi cation system's framework may predict risk for complications such as amputation and infection ... just as it is best for one to be conversant in more than one language, it is best to be fluent in numerous classification systems ..."(6). Generally speaking the Wagner and the UT seem to be the most commonly used (or at least known) classification systems, although or perhaps because they are already quite old. Physicians, Physiotherapists, Athletic Coaches and many more are familiar with the handling of a standard tape in order to immobilize and support parts of the body i.e. finger joints or the ankle joint. Elastic tape has different characteristics and therefore the handling is different. Prepare the skin properly before attaching the elastic tape: Clean the skin with soap and warm water and dry properly. Do not use alcohol based cleansers or any cleanser that influences the pH-balance of the skin. The heat sensitive adhesive used in the elastic tape is Hypoallergenic though in some rare cases the skin may have a reaction. If irritation does occur, remove tape immediately after 1st soaking it with warm, soapy water. A very few number of patients have experienced redness, itching or tiny blisters. Remove hair on the area to be taped. If you shave, do it one or two days before the taping application to allow the skin to heal from micro irritations due to the razor. If you want to apply immediately, it is better to trim the area instead of shaving it. Do not apply directly from the roll. Measure the required elastic tape length and cut the strip by using scissors. Don't try to rip the tape by hand as one would with the standard tape. Round off the corners with the scissors. Don't try to peel the protective paper at the edges. Remove backing by holding the tape firmly with both hands at approximately 7 - 8 cm from the intended base or end and stretch a tear in the paper backing. Avoid touching the adhesive side of the tape after removing the backing. The adhesive is silicon based and reacts instantly when in contact with the skin. Elastic Tapes are intended for 'single use' only. Apply the tape with the outer rim of the thumb and be careful to avoid bulging or creasing. Ensure the ends are applied without any tension. After desired application, activate the heat sensitive adhesive by rubbing over the surface of the tape lengthwise. This will influence the longevity and wearability. The tape has to resist mechanical strain. So don't wear too tight of clothing over a tape application. After bathing, simply pat dry the taped area and do not rub with a towel. Night splints are a treatment option with high healing potential. But what about wearing an additional device to support healing during the day? According to A. Jacobs(1), 21 % of patients with plantar fasciitis are also subject to swelling and edema. And of these patients he identified a small group as having plantar fascial fibromatosis (Morbus Ledderhose). Although a true Morbus Ledderhose is less common, it usually occurs in the middle and medial part of the plantar aponeurosis(2). In the Jacobs findings, 25 % of all plantar fasciitis cases experience some kind of fibromatosis. The final 54 % of those suffering from plantar fasciitis were related to degenerative conditions caused by age and/or overuse. In this group, there was an occurrence of tiny, even microscopic tears in the plantar aponeurosis, which can eventually lead to a partial rupture. (2) Sharma S, (2003) "MRI diagnosis of plantar fibromatosis - a rare anatomic location" The Foot 13 (4): 219-22. doi:10.1016/S0958-2592(03)00045-2. Wearing a wedged post-surgical off-loading shoe usually leads to pre-stretched calf muscles which automatically leads to a reduction of the walking speed which then leads already to a certain pressure reduction. The main off-loading effect results in the interruption of the normal gait. Without the toe-off phase, there is no pressure on the forefoot, nor any joint movement in the MTP Joints. Beside a potential knee and back pain issue due to the height difference of a wedge shoe to the contralateral shoe, the main problem is still the patient's gait. Patients intend to walk with a full gait circle including the toe-off phase. But "walking normal" in a wedge shoe leads to a tilt forward and the shoe'stip acts like a stopper so that the patient's heel likes to slip out of the shoe. This heel slippage leads to a movement in the MTP joints and an increased pressure under the metatarsal heads. Even a pre-surgical gait training for patients does not necessarily result in a proper gait with a wedge shoe. Plantar heel pain is often diagnosed as a heel spur syndrome. Statistically every third person shows a radiographic prominent heel spur, but usually without any pathology. When there is pain, it is most often related to plantar fasciitis. Beneath the skin and a fatty pad of the plantar aspect of the foot (sole), there is a thick connective tissue which supports the arch of the foot; the plantar fascia or plantar aponeurosis. This relatively wide structure, spans between the medial calcaneal tubercle and the proximal phalanges of the toes. Due to overuse, the connection of the plantar fascia at the calcaneus can become inflamed creating pain, and hence, plantar fasciitis. Patients often report stabbing pain that usually occurs with the very first steps in the morning. Once the foot limbers up, the pain of plantar fasciitis normally decreases. Although, it may return after long periods of standing or after getting up from a seated position. Plantar fasciitis is particularly common in runners. In addition, people who are overweight, women who are pregnant and those who wear shoes with inadequate support, are also at risk of contracting plantar fasciitis. Treatment options for plantar fasciitis include rest, massage therapy, stretching, weight loss, night splints, motion control running shoes, physical therapy, hot and cold therapies, custom orthotics, anti-inflammatory medications, corticosteroids injections and surgery. In refractory cases, extracorporeal shockwave maybe used. Finally in some cases, massaging the inflamed location may offer temporary relief. If not treated properly a plantar fasciitis can result in a heel spur. Heel spurs develop as an abnormal growth in the heel bone due to calcium deposits that form when the plantar fascia pulls away from the heel. This stretching of the plantar fascia is usually the result of over-pronation (flat feet), but people with unusually high arches (pes cavus) can also develop heel spurs. Women have a significantly higher incidence of heel spurs due to the types of footwear worn on a regular basis. In 1954, J.H. Hicks described the biomechanical effect of the windless mechanism in relation to the plantar aponeurosis and the arch of the foot. A reference work for the development of modern night splints, such as the DARCO Body Armor® Night Splint. Fully Rocker Bottom Sole or is a flat mid-stance required? Short term, wound care shoes like the DARCO MedSurg have a fully rocker sole. But patients with chronic wounds and deformities, as in the case of neuropathy, often suffer from limited sensory feedback from their feet. The result is a sense of imbalance, insecurity and instability. In fact, a proper rocker bottom with a more proximal pivot point for the MTH supports an increased propulsion at the toe off while reducing the floor contact time and limits the range of ankle motion. Bearing in mind that during the gait cycle, 40 % of the time is the swing phase of one leg, and the remaining 60 % of the time is dedicated to the standing leg. For the diabetic patient or one suffering from neuropathy, this 60 % internal in time may create a feeling of instability. For those who have poor balance or weak muscles, this creates an even greater risk of falling. Literature shows, that a multilayer insole, with varying foam densities, produce better results than a singular microcellular rubber. For example, a combination of Plastazote®, EVA and Poron® prove to be a more effective cushioning insole. PLASTAZOTE®: In Podiatry, the selective use of a range of AZOTE foam densities is used to provide extra support for foot disorders. An accurate impression of the plantar surface of the foot can be obtained by placing the foot on a piece of Plastazote® and applying the full body weight. PORON®: Poron® Urethane materials have been considered the industry standard for cushioning and biomechanical support. Their consistent quality, durability and versatility make them easy to use for shock absorption and soft cushioning. EVA (Ethylene vinyl acetate): is the copolymer of ethylene and vinyl acetate, popularly known as expanded rubber or foam rubber. The weight percentile of vinyl acetate in the foam will vary between 10 and 40 % which then translates into the "Shore" hardness. I.e. Shore A, EVA foam is used as padding, shock absorption and weight redistribution in therapeutic shoes. Ankle sprains are one of the most common sports injuries, but can happen during daily work or leisure activities as well. General knowledge often leads patients to cool the ankle with ice. Recent Studies have shown that a pure R.I.C.E. * treatment for ankle sprains can actually delay the healing of the injured area. Whereas M.E.A.T. **, can encourage and promote the healing process. An acute ankle sprain could still be treated with R.I.C.E. immediately, but only for a maximum of 48 hours. Uninterrupted icing is not recommended. Cooling can help reduce the initial, massive swelling of an injury at first and act as a pain reliever. This is especially affective in combination with compression. But a permanent icing can also have a negative effect - in worst case - frostbite. After 48 hours, careful movements are found to promote the body'sown mechanism to heal the injured area. Coupled with physiotherapeutic treatment may actually lead to faster recovery. Naturally, it is important not to overuse the injured ankle and to keep it protected from re-injury. The several braces and orthotics available are designed to prevent unintentional supination/pronation or the reoccurrence of trauma. The different braces are designed to fit the requirements of the patient, i.e. severity of the ankle sprain, patient'sactivity level and the patient's determination to return sporting activities, etc. So if you suffer from a grade II or III ankle sprain, don't neglect to consult your physician. Tseng CY1, Lee JP et al, (2013) "Topical cooling (icing) delays recovery from eccentric exercise-induced muscle damage"
After surgical corrections of bunion deformities (Hallux Valgus) the MT1 osteotomy may show a clear correction of the IM-Angle, but a lateral release can help improve the over-all surgical results and can be seen as an indispensable procedure to restore the function of the first metatarsophalangeal joint. As a result of a bunion deformity, the sesamoid bones tend to shift to a dorsal-lateral position. This is simply due to an imbalance created by the pulling forces of the flexor and extensor tendons and the strong pulling force of the adductor hallucis muscle. Hence, the benefits of a lateral soft-tissue release is used in combination with the bony correction to ease the pulling forces. The lateral release can be achieved in multiple ways. First and the more widely used among foot surgeons, is by making a dorsal incision in the interdigital space between the first and second metatarsals (MT1 and MT2). Other surgical approaches include an intraarticular approach with a beaver blade or a mini scalpel or the plantar approach by using a sharp, curved chisel (i.e. McGlamry Elevator, 11 mm) where you can cut the tendon of the adductor hallucis muscle. If necessary, the transversal metatarsal ligament between the lateral sesamoid and MT2 can be transected, as well. Once released, the sesamoids can shift back into their correct anatomical position under the head of MT1. Today, a huge assortment of postsurgical, fixation devises are available. All of which are designed to stabilize the corrective surgery. The golden standard still remains the SPICA style of dressing for postoperative treatment immediately after the sterile compression dressing is removed. This postsurgical protocol insures that the sesamoids remain under the first metatarsal head as the healing progresses. 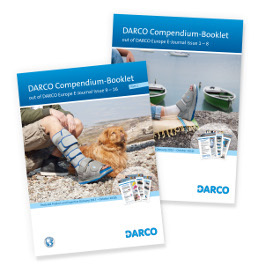 After one week, the SPICA dressing can be replaced with an easy to apply - for the physician and as well as the patient - redressing bandage or splint as for example the DARCO TAS® (Toe Alignment Splint). The Lapidus or TMT1 Arthodesis requires an off-loading in the operated area to avoid pseudoarthrosis. The PegAssist® Insole can increase the benefit of a MedSurg post-op shoe by reducing the leverage effect. 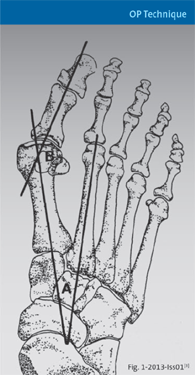 The TMT1 Arthrodesis, described by Lapidus in 1934, is a powerful technique for the correction of a wide IMA in Hallux Valgus deformities which include an elevation of the first ray and/or instability in the medial tarsometatarsal joint. Depending on the surgical experience and the availability of surgical tools the two joint surfaces (MT1 and the cuneiform bone) are first spar- ingly resected. If necessary, a wedge with lateral base may be removed from the cuneiform bone to correct the IMA. Shortening must be compensated through plantarization of the MT1. This will offset any elevation of the MT1 head. The internal fixation is usually done by two or more compression screws or locking plates or a combination of both. Especially if plating systems are applied from dorsal or dorso-medial it is possible that the arthrodesis might open in the plantar aspect in case of early weight bearing. One solution can be the usage of plantar locking plates. If such implants are not at hand and a traditional fixation is done, the second option can be to modify the footwear. 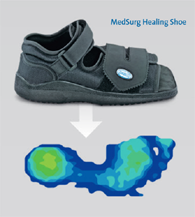 A post-op shoe like the DARCO MedSurg already reduces the peak pressure under the metatarsal heads. 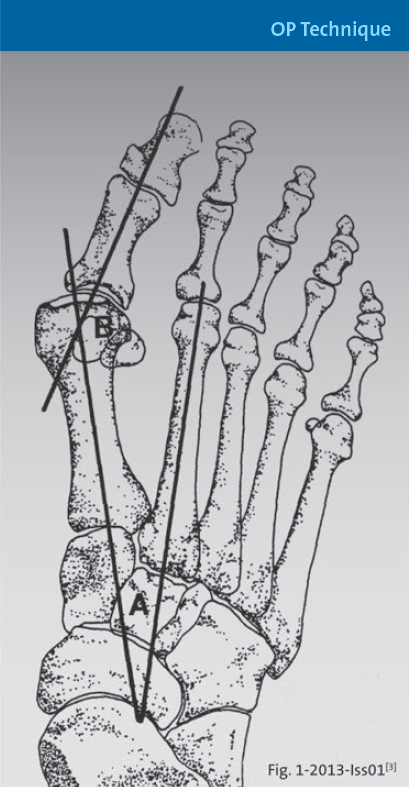 Peg removal beneath the 1st MPJ additionally reduces the "lever effect" thereby reducing stress along the entire length of the 1st metatarsal and reducing pressure on 1st metatarsal osteotomies or fusions. Addis-Thomas Eliza "The Lapidus Procedure"
In: Saxena, (2012) "International Advances in Foot and Ankle Surgery"
While Literature in the year 1930 described just 25 techniques to correct bunions, today we can count more than 150 techniques. These techniques include corrections of the phalangeal bones as well as the metatarsal bones and/or the belonging soft tissues. One of the most frequently used methods in mild deformities (Grad 1-2, IMA < 15°) is the V-shaped osteotomy, also called CHEVRON or AUSTIN. The idea is to shift the Metatarsal head from medial to lateral. This technique not only allows a two-dimensional correction of the intermetatarsal angle, but also - if needed - a lengthening or shortening of the 1st ray, as well as a plantarisation of the metatarsal head, depending on the direction of the osteotomy. Different variations of this technique are prescribed. Primarily influenced by the critical direction of the osteotomy in relation to the blood supply to the metatarsal head. Additional osteotomies - like AKIN - might be required in the first phalangeal bone. Also soft tissue correction - mainly the so called LATERAL RELEASE - might be required to finally get the first ray back into a straight position and having the metatarsal head covering the sesamoid bone again. The osteotomy is usually performed through a medial or dorsomedial surgical approach. The cut itself looks a bit like a V-shaped cut. 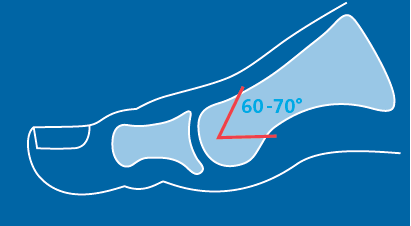 A 60° - 70° angulation is recommended, but may differ from case to case. Fixation with a K-WIRE in the early days was common; nowadays a cannulated compression screw is regarded to be the standard. 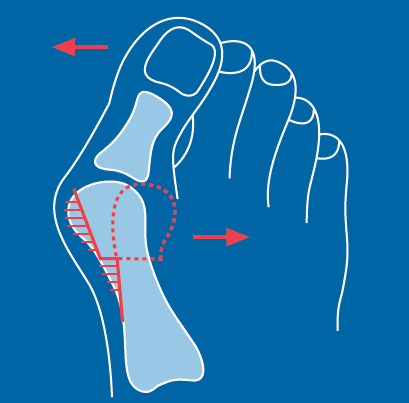 For post-op treatment a forefoot off-loading shoe like the DARCO OrthoWedge® can be recommended. Attention: the correct treatment always is determined on a 'case by case' basis and the surgeons experience. 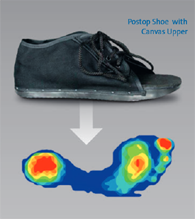 Worldwide the common understanding of using post-op shoes for pressure reduction is to use devices with a stiff sole. But design and function can still make a big difference in the results. In the 80's, surgeons preferred to have post-op shoes with a stiff, flat sole to reduce joint movements after surgical interventions such as bunion correction surgeries. Those shoes often had a wooden sole with a canvas upper. 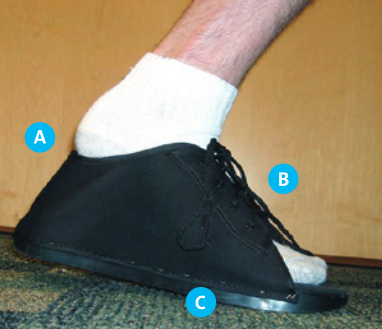 Besides their weight, these shoes often showed heel slippage (A), increased dorsum pressure (B) and as a result increased pressure under the MT1 (C) due to a dorsoflection in the MTP1. With the development of the Original MedSurg DARCO managed to decrease the pressure by changing the material and closing mechanism. This reduced the peak pressure under the MT Heads by up to 24 % and under the Great Toe up to 32 % compared to a standard canvas shoe. Another possibility to reduce the negative effect of pressure is to reduce the pressure time. Therefore the current version of the MedSurg Healing Shoe was engineered not only with an exchangeable insole made of EVA with between 30° and 35° shore A, but also with a rocker sole outside. While inside the shoe, the foot is still protected by a stiff and flat position; the rocker sole reduces the floor contact time and at the same time helps to mimic the natural gait. This reduces the peak pressures compared to the Original MedSurg by another 21 % under the MT Heads and another 41 % under the Great Toe. 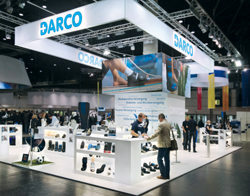 The standard insole can also be replaced by a special wound off-loading insole by DARCO, the PegAssist. More information on this issue is available here: PegAssist Insole Off-loading Insole.